‘25: MAKE DO AND MEND, the author buys a treadle-powered sewing machine, guaranteed to work even when the lights go out’. That was the one. Chapter 25. 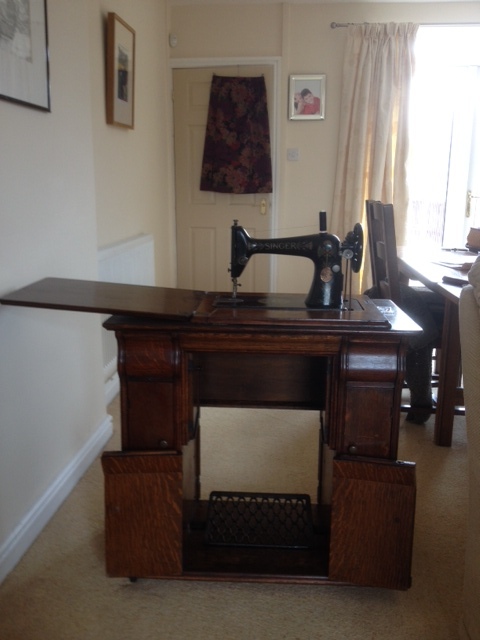 It had me scouring Ebay, putting in a winning bid and doing a 172 mile round trip to pick up a Treadle Singer (not terribly eco-friendly but I reckon it was worth it). When I say ‘pick up’ I mean it was the extremely kind and helpful sellers who put it in the back of my car. And my cousin and her husband who offloaded it. There are some things a 5’ 1” woman of a certain age can’t tackle. That was just the start. In the past week you’ve inspired me to learn the intricacies of treadling, to take up scissors again, to MAKE A SKIRT! Emboldened by this DIY mania, I mended my garden seat with four lengths of chain and my late husband’s socket set. I laid a timed watering system to the veg plot for holiday periods. I tackled rats. Not in the same way as you, I didn’t wriggle under floorboards with traps. But I did move the rats’ habitat – my compost bin – to the other side of the garden where it now stands empty-bellied and filling a gap in my almost-rabbit-proof fence. Some things still have me beat. What makes those one inch diameter tunnels in my border? Rats, adders, voles? Best just to weed around them and put their existence to the back of my mind. Like I did with the mouse who scuttled behind the shed (but not the dead one inside the watering can’s spout). So I’ve done what you said. I’ve gone a little bit further towards a more sustainable world. I’ve sourced an organic fabric company in Machynlleth who do Fair-trade. I’ve got plans for yoga pants. But mainly, John-Paul Flintoff, I’ve had so much fun!